Kalantari, H., Rashidi, I., Nazari, Z., Keliddar, A., Foruozandeh, H., Kalantar, M. (2014). Study of the Protective Effect of Livergol against Liver Toxicity Caused by Bromobenzene in Mice. Iranian Journal of Pharmaceutical Sciences, 10(2), 11-20. Heibatullah Kalantari; Iran Rashidi; Zahra Nazari; Atefe Keliddar; Hossein Foruozandeh; Mojtaba Kalantar. "Study of the Protective Effect of Livergol against Liver Toxicity Caused by Bromobenzene in Mice". 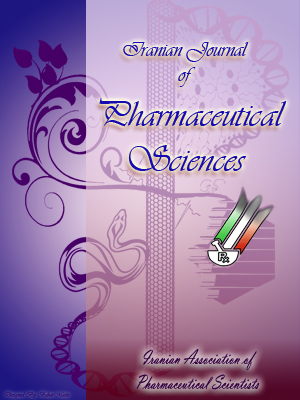 Iranian Journal of Pharmaceutical Sciences, 10, 2, 2014, 11-20. Kalantari, H., Rashidi, I., Nazari, Z., Keliddar, A., Foruozandeh, H., Kalantar, M. (2014). 'Study of the Protective Effect of Livergol against Liver Toxicity Caused by Bromobenzene in Mice', Iranian Journal of Pharmaceutical Sciences, 10(2), pp. 11-20. Kalantari, H., Rashidi, I., Nazari, Z., Keliddar, A., Foruozandeh, H., Kalantar, M. Study of the Protective Effect of Livergol against Liver Toxicity Caused by Bromobenzene in Mice. Iranian Journal of Pharmaceutical Sciences, 2014; 10(2): 11-20. 1Faculty of Pharmacy School of Ahvaz, Department of Pharmacology and Toxicology, Ahvaz Jundishapur University of Medical Sciences, Ahvaz, Iran. 2Faculty of medicine School of Ahvaz, Department of Pathology, Ahvaz Jundishapur University of Medical Sciences, Ahvaz, Iran. 4Department of Pharmacology and Toxicology, Pharmacy School, Ahvaz Jundishapur University of Medical Sciences, Ahvaz, Iran. Liver is a major organ of the body which can be exposed to various chemicals, drugs, and many other xenobiotics such as bromobenzene. Bromobenzene must be converted to its active metabolites to produce liver and kidney toxicity. Livergol is an herbal product which contains silymarin. The objective of this study was to find out the protective effect of livergol against liver toxicity induced by bromobenzene in mice. In this study, doses: 50, 100, 200, 300 mg/kg of livergol were administrated to mice orally 2 hours after bromobenzene(460 mg/kg) administration for 7 days (test groups). The negative control group received normal saline. The positive control group received 460 mg/kg of bromobenzene orally. 24 hours after the last administration animals were sacrificed; their blood was collected to determine serum enzyme activities of aspartate aminotransferase (AST) , alanine aminotransferase (ALT) and alkaline phosphatase (ALP). The livers were removed for histological examination.The results showed that livergol at doses 200 and 300 mg/kg cause significant reduction in the level of enzymes (p > 0.05). The histopathological study of liver tissues showed that doses of 200 and 300 mg/kg are more effectively restore tissue damage to the normal state. Our finding indicated that livergol in the high doses (200 and 300 mg/kg) have protective effects and cause significant improvement in the liver tissue and biochemical markers in bromobenzene intoxicated mice.